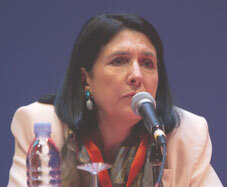 Salome Zourabichvili called the decision taken by the Court of Appeals disgraceful. As it stands now, the resolution that does not allow dual citizenship persons to participate in the presidential election will remain in force. The statement was made on September 10, after the session of Court of Appeal ended. "Today's decision is a disgrace not only to this court, but for the entire country. Not because of me and my candidacy, but because it refers to the entire Georgian political emigration,” she said, stressing that it marks the end of this episode in our history. Zourabichvili also said that now that Georgia has “54 presidents” not presidential candidates. "I used to subordinate to the law that told me what to do for registration as a candidate, and what to do for the presidency, I have not made any other steps, but one step I have made anyway was when I went to the French Embassy and left the application about citizenship, ceding a request that would have been complied to on the same day, when the population picked me as president,” she said, stressing that this information is for those who are spreading rumors that Zourabichvili was not going to refuse her dual citizenship. She then tore the abovementioned application saying that the court did not even ask her if she was going to revoke her French citizenship. However, after the court’s refusal to register her as a presidential candidate, Zourabichvili said she will not cede her dual citizenship anymore. In other news, the Central Election Commission (CEC) has already registered another candidate with dual citizenship, Zurab Tsitsuashvili. Tsitsuashvili is at the second stage of registration, where he must present 40, 000 signatures of support. Zourabichvili declared that she is launching a new round in the legal battle. “Now we are putting into question the competence of the CEC, which means that the issue about the legitimacy of the election arises. Soon the new chairman will be appointed and we demand that CEC reconsiders the incompetent decisions that call into question the legitimacy of the elections," stressed Zourabichvili. Regarding the court's decision, the court of appeal said the decision is final and cannot be appealed. Zourabichvili's case was considered by the panel of judges including the following members: Tea Tadashvili, Tea Dzamistarashvili and Merab Lomidze. "If a person cannot be president, she cannot be a presidential candidate as well," said Tadashvili. The CEC officials said that the Court of Appeals examined the evidence presented as factual circumstances to the case and upheld the District Court's decision on legal grounds. The CEC believes that the court decision was absolutely fair. The CEC also refused to register the other interested candidates with dual citizenship including Tsitsuashvili.